Hello lovelies! 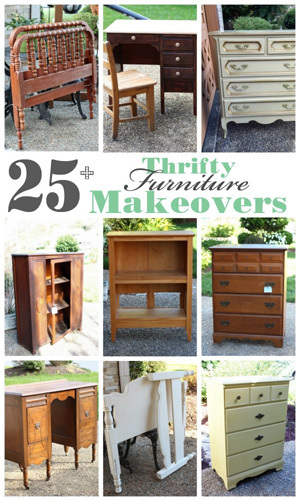 I have a thrifty little redo for ya’ll today! When I find something at a thrift store, I can almost always imagine the end product right then and there. But then there are times when I find something having no earthly idea what I’ll do with it, but I throw it in my cart anyway. Those are the things that sit there in my to-do pyramid for months mocking me. People!! That’s more than 24 months I had to dream up an idea for this thing. I picked it up so many times. 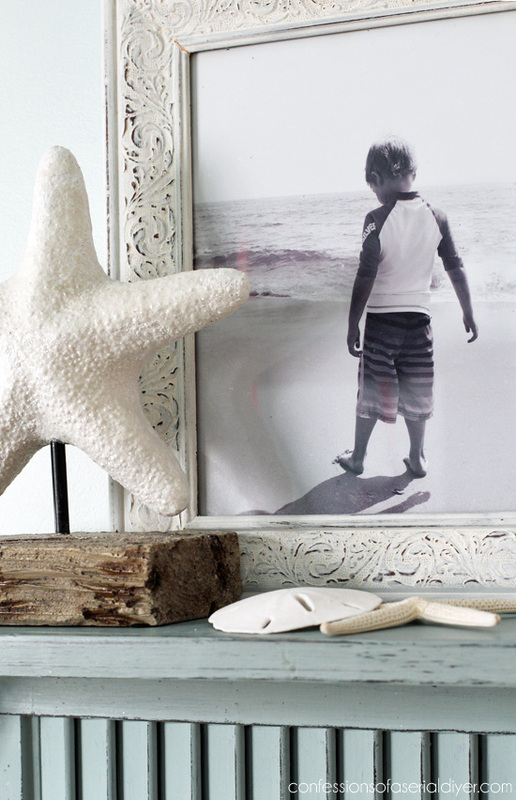 Do you know how many ideas there are out there for shutters? And that was the problem. I was trying so hard to find a unique new undiscovered purpose for this thing and it just never came to me. And believe me I tried to donate it back, I really did, but I just couldn’t give up on it. Not exactly the ground breaking revolutionary new idea I was hoping for for this thing, but it’s pretty darned cute, right? 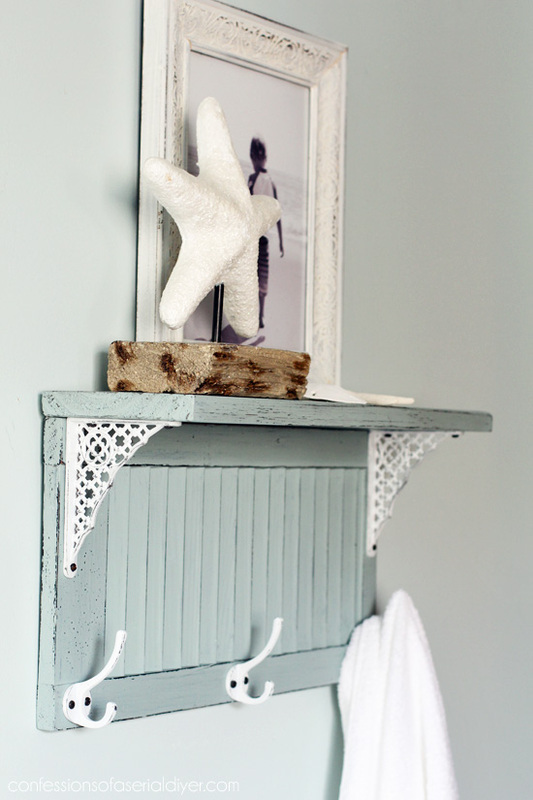 And every room in the house can use a cute and functional shelf! So that’s what I finally settled on. I found a piece of wood in the garage that was left over from another project to create the shelf. I spray painted it black first so that the finish would look the same as the shutter after sanding it a bit. 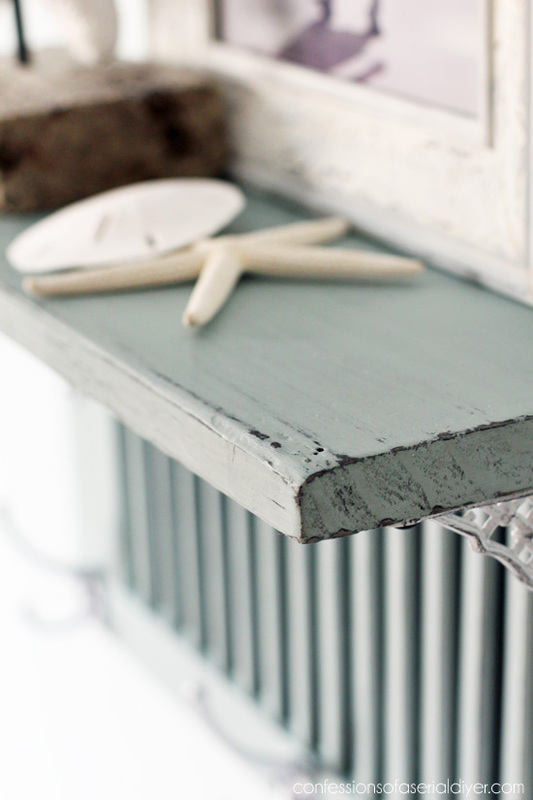 This color is Grey Morning by Behr made into chalk paint. There were bright gold. I sprayed painted them black first, then gave them a couple of coats of white spray paint, then sanded them a bit. This would be perfect in a bathroom! Please tell me you also hoard things that you just know you’ll eventually find a use for? 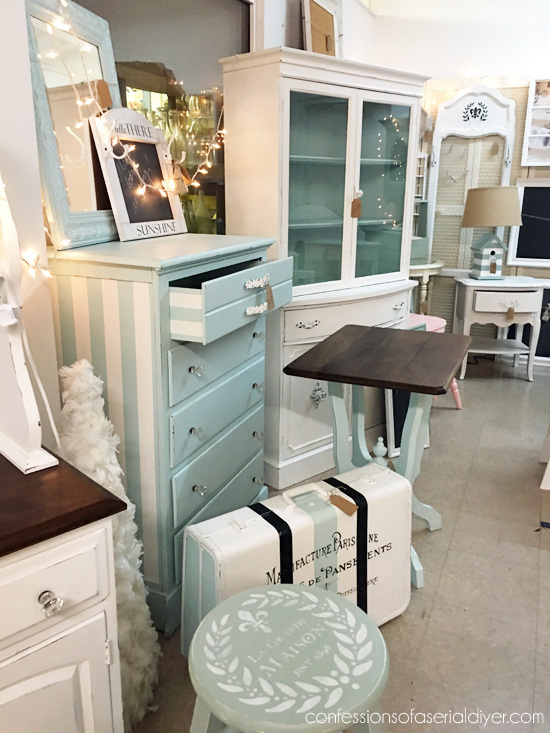 UPDATE: See the makeover of this little gem HERE now! best use of a shutter I have seen. just love what you did. This shelf is so cute! 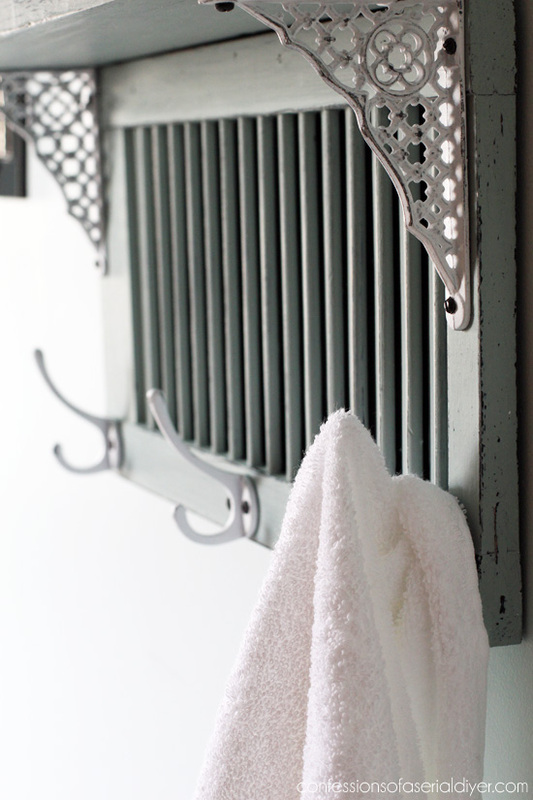 What a great way to repurpose a shutter. Not to be weird but I could kiss you for this idea!!! I have a full size shutter and 2 small ones that I bought and have been sitting for…well, two years now that I think about it! LOL You’ve given me an excuse to go to the architecture salvage shop to look for brackets and that alone is worth a happy dance! Oh yes, I am a hoarder also. That is a sign of a DIY’er. I love this project. Yes, I agree it’s pretty darn cute! 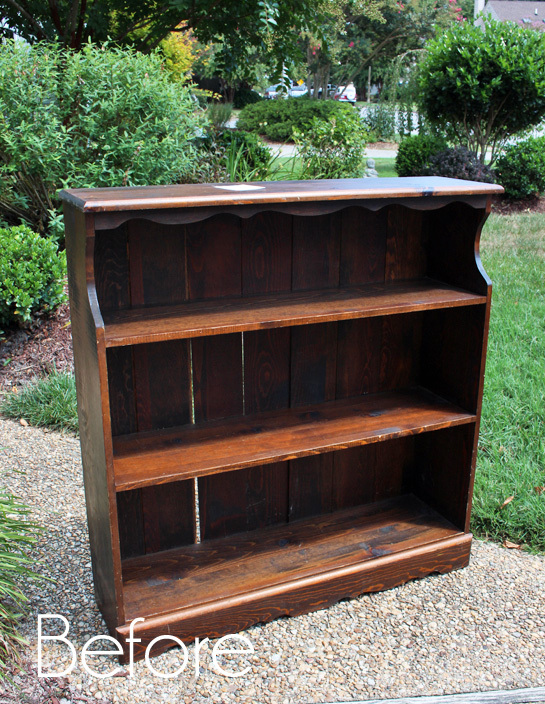 Oops correction…the bookcase is Serene Breeze by Behr! Oh Christy, you wanna compare pyramids? I happen to be working on a pyramid project today. 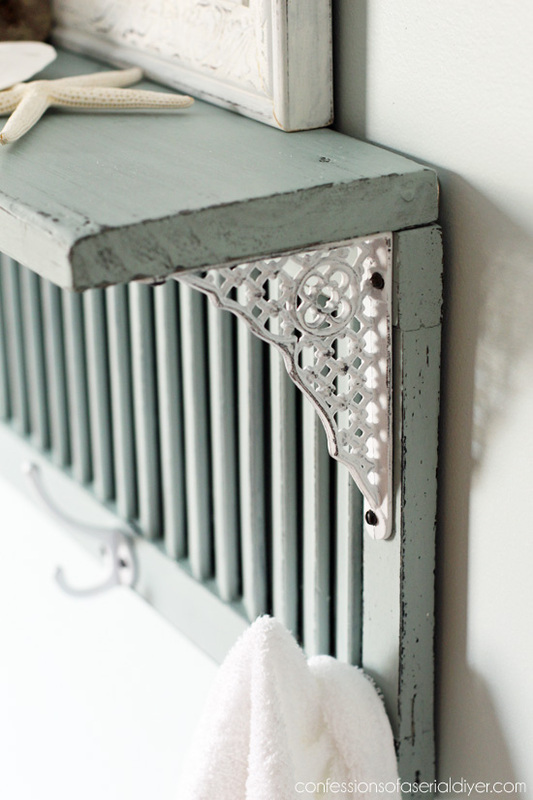 What a great shutter repurpose – love it and pinning to share! 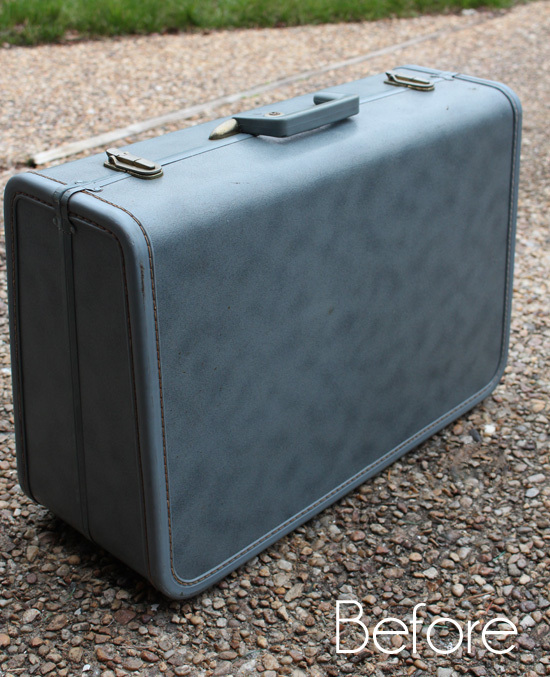 So like the rest of the comments I too have loads of “projects” sitting around, I have a full length shutter hinged door I got for free leaning on a tree, the lady had just put out!! It is stained medium brown. 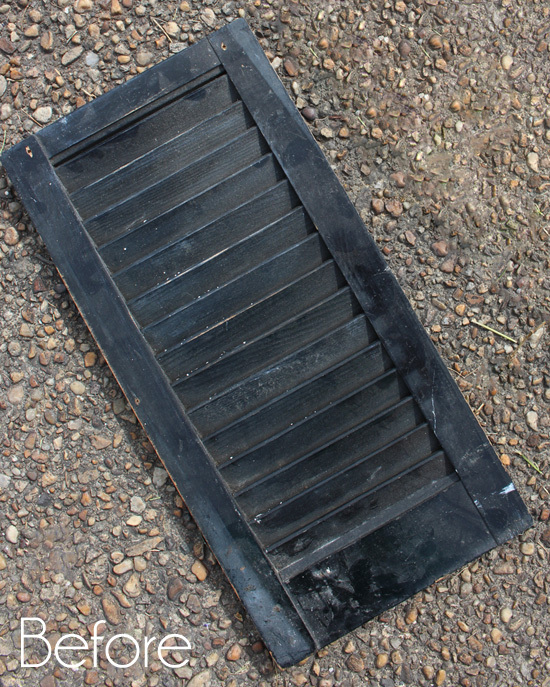 (YUK) The most daunting part is painting louvers!! 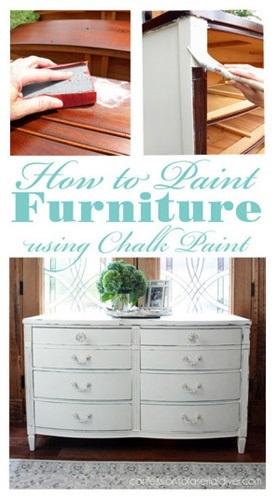 Any good tips besides a paint sprayer which I do not own?? 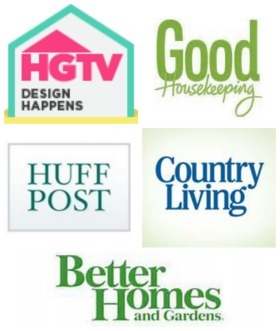 Love all your ideas and I think you accomplish a great deal as a DIYer with a young family!! i have a shutter shelf like yours that I love and got for $20 at a small shop. I knew it was a bargain! Cute makeover Christy! I love the colour! And that picture of your little guy is so precious. 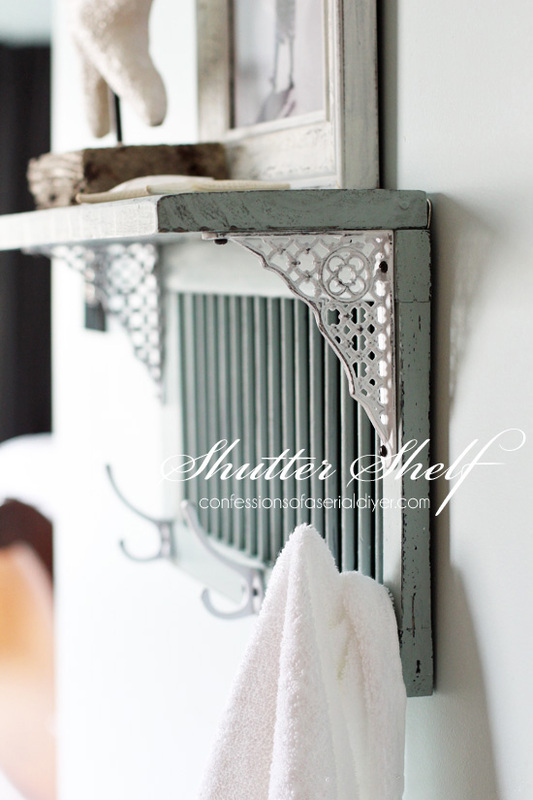 Your shutter shelf is so charming, and I love the color. Love what you did with this! You have great vision. 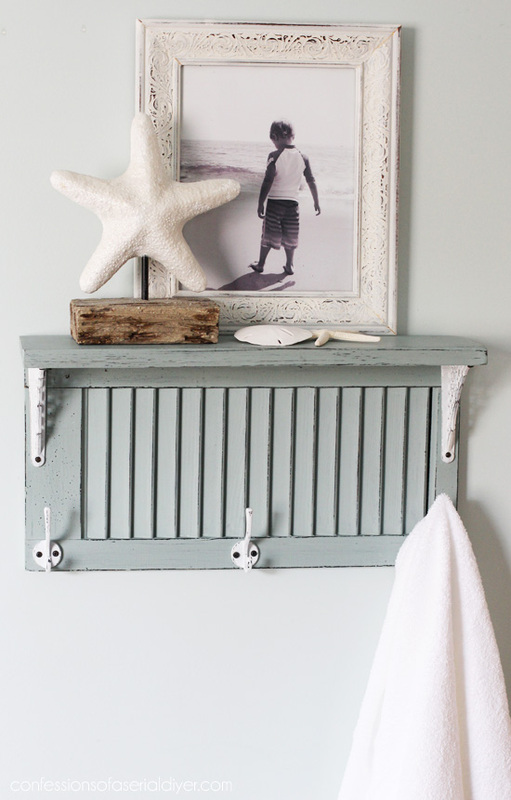 You took three things off your pile — the shutter, brackets and left over wood and made something fabulous out of someone’s cast offs. Love it! A great piece! 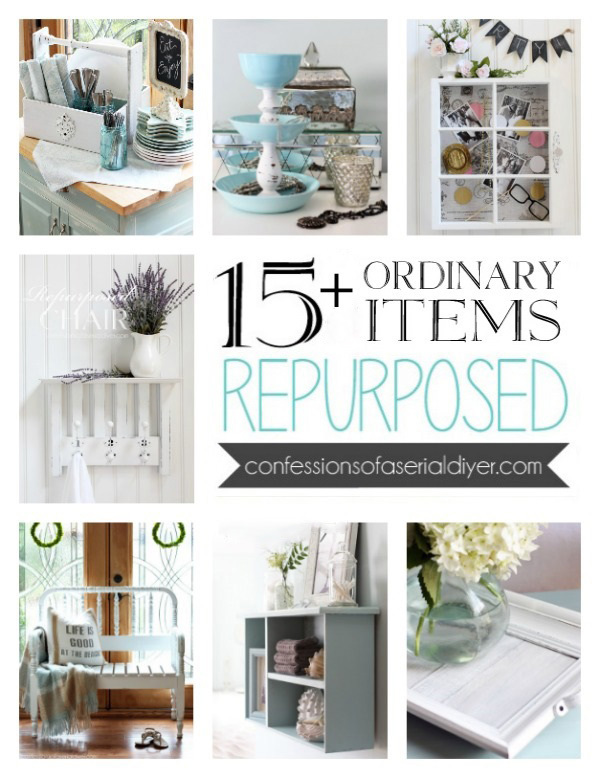 I love how you took pieces from so many places and combined them into a cohesive unit! It’s gorgeous! 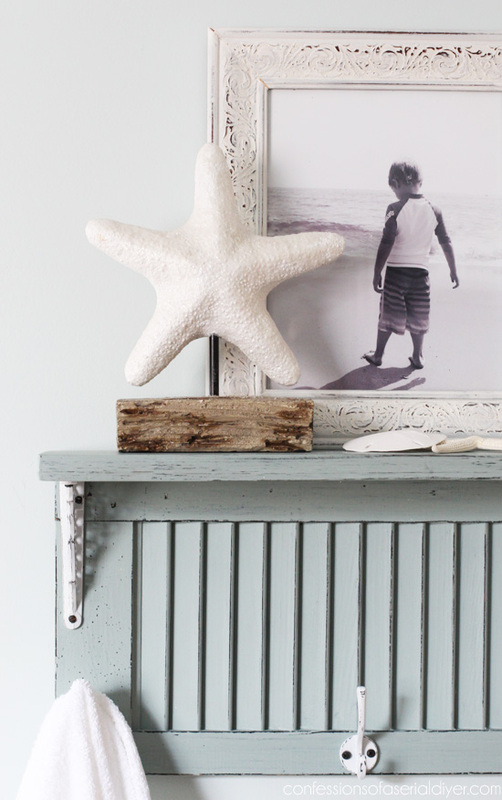 I also have some shutters that I would love to do this with. 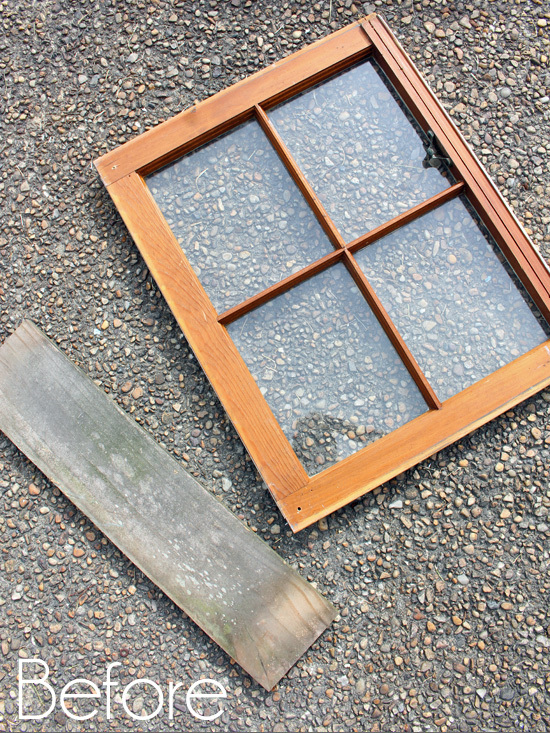 Did yours have the wood strip thingy on the back that moves back and forth to open and close the shutters? If so, did you remove it? I’m afraid my shelf won’t hang flush if I don’t, but I also don’t want the thing to fall apart on me…. Mine did not have that piece, they were stationary. I think yours would fall apart if you tried to remove it, but you could use it with that stick piece facing out.